The sky was a shivering mass of grey clouds, black wind and dark whistling. Like a cackling of a dark witch, ready to spring on an unsuspecting victim and take away all his joy and his soul with it. The Prince shivered but forced himself to straighten his spine and prod his horse into a trot. He was close, close enough to see the magnificent and imposing castle, that, even half-ruined, inspired awe and fear; partly, he thought to himself distractingly, because he was situated on a mountain of rocks, rocks so sharp they seemed unnatural, as if some giant sharpened their edges so they were now prepared to slice and kill anyone stupid enough to get too close. The path winding like a serpent through them brought at once a relief as well as nerves. Nearing his destination and his dreams, his excitement was barely noticeable now, after slowly dropping all those days spend traveling and he had to keep repeating in his head he was prepared, or, as prepared as he could, given the circumstances. No one could prepare him for what the fight he came here to survive and, if he was brave and skilled enough, to win. No amount of advice from all other princes, some who already found their wives, some who are still looking for their own dragon to slay - a princess to rescue, would ever be enough. Magic worked in mysterious ways and he had to be worthy of the princess if the dragon was to ever fall by his sword. Skills and luck were what he needed if he was not worthy and would need to run away, to continue his search elsewhere. His horse skidded to a halt and he had to none too gently slap him behind the saddle to get him moving again. This was their first dragon and the horse was as careful and nervous as his master, even more so as his nostrils widened and caught a scent unlike any other, a scent that was made of everything and nothing at all but, in the end, spelled the same thing: death. The prince was watchful and wary, but hope gave him the strength to plod forward. His tunic was no match for the wind and cold, but he did not regret not putting on his armour. The princes laughed at him, but the hard facts were clear and he would rather be fast enough to dodge and run, instead of getting cooked like a pig in his own cage of iron that was supposed to protect him and might just be his downfall. The closer he got, the more the dread in his stomach grew. His mind was searching the ruins for any signs of the beast as well as trying to see if he can tell where was the princess resided – or, more precisely, which one of the three standing towers, was hers. There were no outward signs, but he knew enough tales and rumours to decide to head for the tallest one, hidden partially behind its relatively short sister, that looked, due to its height, sturdy and thick enough to offer a sanctuary for a young and frightened princess. Finally, he came to the rocks, that gave him at least an illusion of some protection and he did not hesitate to guide his horse into the stone maze. The dragon, at least, would not be able to land there and, as long as, he could outrun its fire, he should have, at least, a chance. He got of the horse, unstrapped the lifeless body of a deer from the horse’s back and dragged it as far away from the rocks as he dared to go in his frightened state. He did not waste time thinking nor staling, immediately coming back to his horse and in a move he performed countless times, jumped on his back and was already heading deeper into the echoing labyrinth of death. The ascent lasted a heart-stopping eternity. Not only because the path refused to take the shortest route to the castle – the Prince was waiting for something, a screech, a movement, a gust of wind, anything that would alert him of the position of his enemy. The lack of any sign, of any movement, made him jump at every echo of every sound he and the horse were making. The most frightening was the path itself. Obviously designed to keep the intruders away, the stone underneath was impossible smooth and white as the rocks surrounding him. They looked nothing alike yet their colour was eerily similar – a shockingly clean white - making the entire journey even more strange and unsettling. He was almost relieved to emerge on a surprisingly big plateau but the sight of the wrecked gate quelled any such feeling he might have. It was a work of the dragon, that much was clear. No on else would be able to twist and melt the huge and surely heavy wings of the massive doors. Everything was wrong. He felt it in his bones. Everything he knew was useless, every story he heard and memorized was a lie. The dragon was not lured by the smell of a fresh meat as he hoped, there was no stench to at least be sure of his presence. And yet… he was terrified. Seeing no other option, the Prince run to the gate, left the horse under one of the fallen arches nearby, took his sword and with a final pat of thanks or a final blessing on the horse´s neck, squeezed himself though the tight opening. This, he felt, was intentional. Stripped of his mount, his chance of an easy escape dwindled considerably. It was, he hoped, a way to discourage those not worthy of the noble heart living inside these ruins, not, he prayed, a trap made by the dragon that was, more often than not, too clever for an animal of his size. It was sheer luck he made it so far, he told himself, swallowed audibly and dashed for the closest usable stairs. The inside of the castle was much like its outer shell, in some places strong and safe, in others utterly ruined. He had no idea where to go, or where he was going. He climbed stairs after stairs, passed hall after hall, never sure whether he already passed that room or not, only sure something will happen if he stops, not pausing for a second, thankful for his young body and strict training for giving him enough breath to push on without a break. The castle was a maze, but, like the stones, he was finally able to find what he was looking for – for he was sure he found one of the towers, the staircase the only thing he could see below and above and it was wide enough to be a part of the tallest tower. At least, it seemed so. The looks here were deceiving, everything changing size and shape depending on how close he was. The little windows offered plenty of light for him not to look for a torch but were too high for him to look outside through them. The staircase was long, which gave him a sliver of hope and, about halfway through, he found a torn dress, which he decided not to dwell on. Was the princess alright? 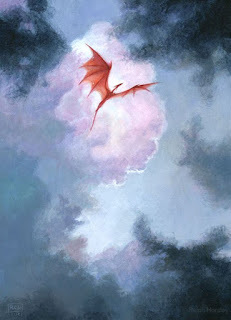 The dragons could not harm their charges, or really any maiden (or woman, really, but that fact was not well-known). But there was no dragon and no princess and something here was very, very strange. Or wrong. He could not tell. The stairs ended in closed doors. He was unsure whether to brandish his sword or tuck in his shirt and try to recall some poetry. There could be anything on the other side so he choose to simply grip his sword and hesitantly, slowly, open the small wooden door. What he found on the other side amazed him – it was, without a shade of doubt, a room lived in by a woman. A strange one but then, if the princess was alone, there were no servants to collect her clothes and fold them neatly into piles or hang them into the open and almost empty closet. The princess would be unaccustomed to such chores and might even fail to see the sense in trying to pretty up her prison. He was certainly quite okay with the chaos, thinking nothing of it. But beside age and some hints on her form, the room held no clues as to its owner. Thin, tall and young – that is all he could glean from the dresses. The clothes themselves hid rich as well as ordinary pieces. Was the girl not a princess? Did she favour the simple fabrics and cuts over more elaborate styles now that she was waiting for who knows how long for a prince to rid her of the curse? With a bated breath, he made a step forward and instantly froze when he spotted a shape through an impossibly wide and tall window. He was looking at his death, he realized, as the shape grew nearer still. He had half a mind to run back to the hall but he stupidly closed them, not realizing there was no handle on the inside, only strange markings, wide gashes, four of them, evenly spaced. He pulled out his sword when the dragon was clearly visible. It was heading towards him, of that there was no doubt. If he was to die then and there, flashed though his mind, he was glad it will be in the hands, claws, of such a magnificent beast. No matter how many times he heard it, he did not believe until that moment how a dragon can be beautiful, more beautiful than any other creature. But it was. Magnificent, huge, elegant and red, a colour of an old wine and fresh blood. He watched as the dragon expertly catched himself on the tower and the window, too frightened, too stunned to do anything as the fearsome creature before him flashes, impossibly, gold and… transforms into a young, smiling woman. Myseľ spisovateľa je ako továreň na nápady ale len máloktorý z nich vyjde na svetlo sveta - na prázdne pláne prázdnej stránky. Having said that, mám po krk skvelých nápadov ktoré idú absolútne nikam. Ak mám nápad, chcem byť schopná s ním niečo spraviť a pravidelne písať, aj keby len denníček, je dobré na tréning and personal growth as a writer. Toto je môj prvý kúsok napísaný... pretože môžem! Len tak. Ja osobne zbožňujem nachádzať na Pintereste všetky tie writing prompts, that gave me just a taste of a perfect story and leave me panting for more. Toto j môj pokus o niečo také a povedala som si, prečo nie anglicky? Som celkom pyšná na svoju vocabulary a style and stuff - čítanie toľkých kníh sa vyplatilo. Scenario A) The girl is revealed to be his sister. Should be interesting. Why? It would be cool if the princess in the story would not be a love interest. A nice change, really. Suggestion: See how the prince struggles with his sister being cursed and forced to wait on some moron with a big sword. Pun intended. Show the princess is freaking ecstatic to be a dragon. Scenario B) The girl is naked! Half-naked? She is also gorgeous. She seduces the prince, who is, of course, a virgin, unlike her. The prince leaves. Why? I like the image of a strong princes that can literary breath fire, is independent and not some blushing virgin. Suggestion: Show how the prince falls in love and the princess stops being afraid that falling in love would take away her wings. Literary. I would not protest should the princess decides to make a revolution so that princesses are not forced to take on a curse and go to a castle with a dragon. Great, right? Scenario C) ... I have no idea! But you can tell me your ideas in the comment section! Maybe she can get grumpy? Yell at him? Imprison him in the castle with her? Or keep him for her entertainment? Maybe she is a witch, maybe she is a lonely girl looking for someone to love, after her parents dumped her in the creepy castle? The possibilities are endless, that´s the point. Hmm... I should so do this more often!